These super easy and simple but oh, so gorgeous mason jar luminaries are a great decor idea for weddings, holidays, Christmas, or even a party! 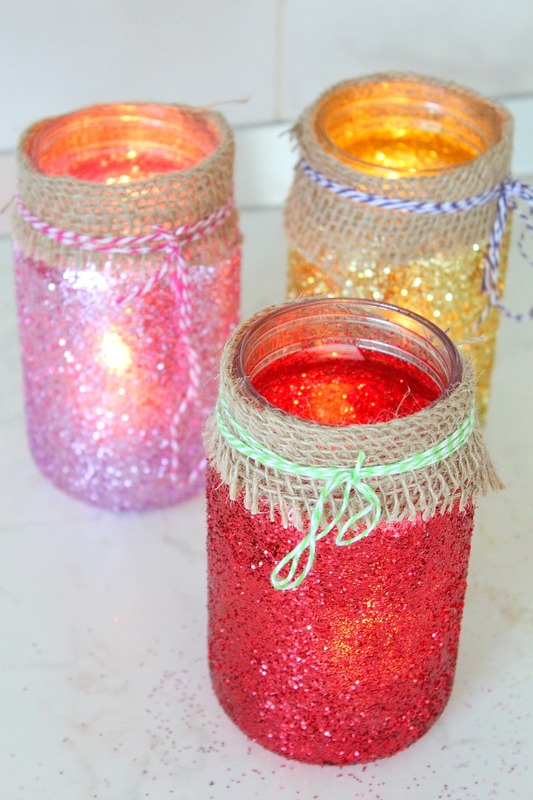 Super easy to transform into jar lanterns! You, guys! I am so in love with these mason jar luminaries (you can tell by the overwhelming number of photos I took)! These simple Christmas luminaries are not only super cute, bright and cheerful but were probably the easiest craft I’ve made to this point! It took longer to wait for the Mod Podge to dry out than to work on these jar luminaries! These DIY mason jar luminaries are so easy to transform into mason jar lanterns and would be such a cute and elegant addition to a festive event like a Christmas party, a wedding, a garden party, they’ll add such a warm glow to your evening! These look so magical at night time! 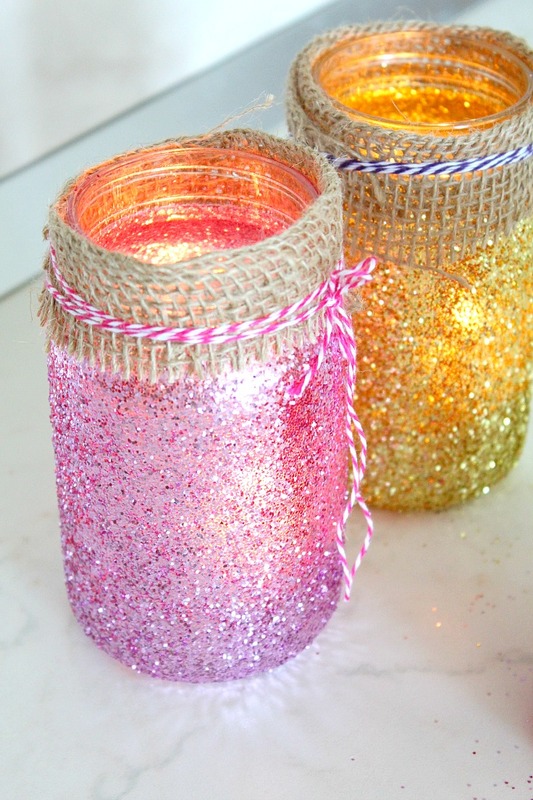 Plus making these mason jar luminaries is super cheap and the result is absolutely FABULOUS! 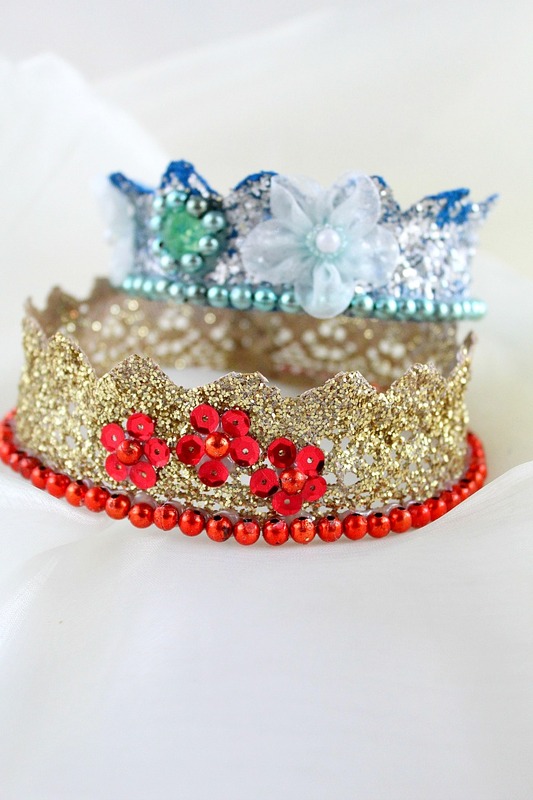 I’m basically surrounded by Mod Podge, and mason jars and glitter are so inexpensive and easy to find, so this project had to be done for absolutely no reason, just for the fun of it! 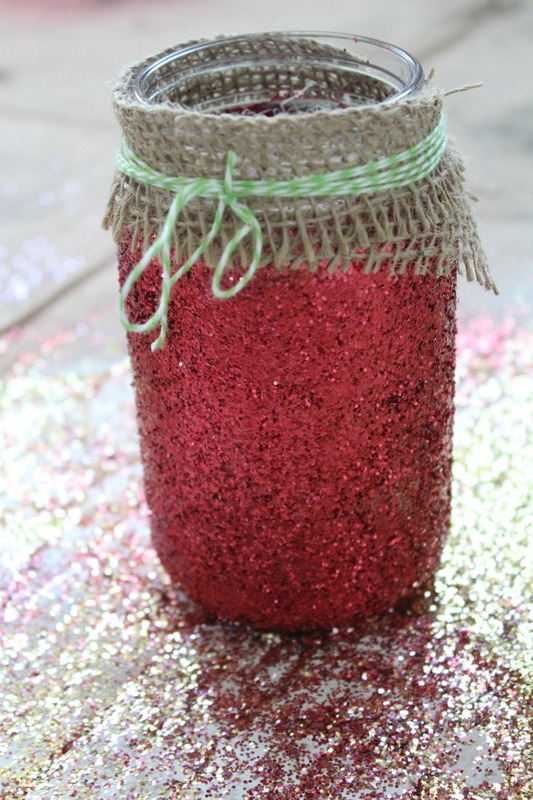 I have worked on my mason jar Christmas decorations by myself but this is such an easy project for kids too, it’ll be so fun seeing them dipping their fingers in Mod Podge or sprinkling that pretty glitter all over the place (ok, ok, maybe the mess is not as much fun, I got a little carried away lol). 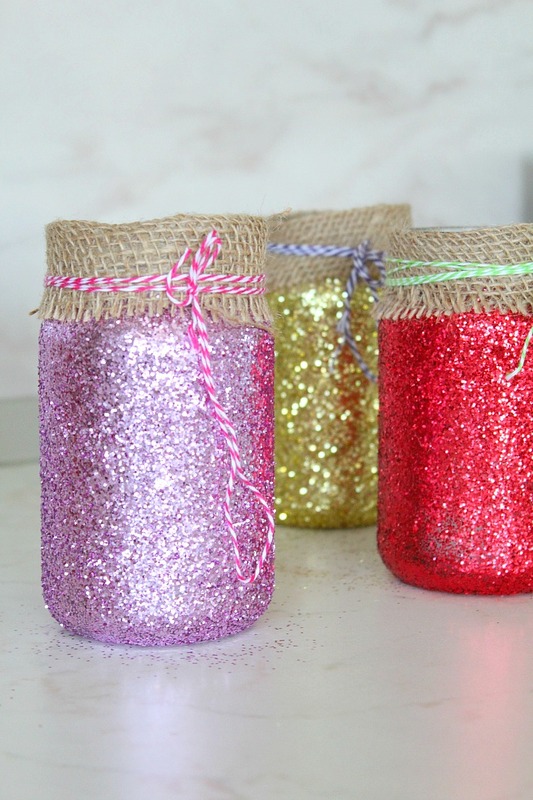 It will keep them busy though and they’ll be proud to be able to make such a pretty craft as these DIY jar luminaries. Start by washing and cleaning your mason jars thoroughly, then let them dry. 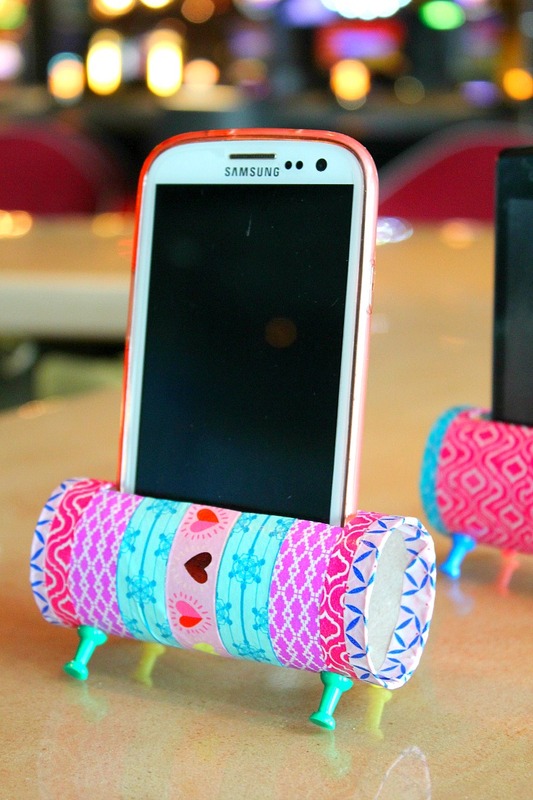 With a brush or sponge apply Mod Podge all over the mason jar, on the outside, except for the rim. 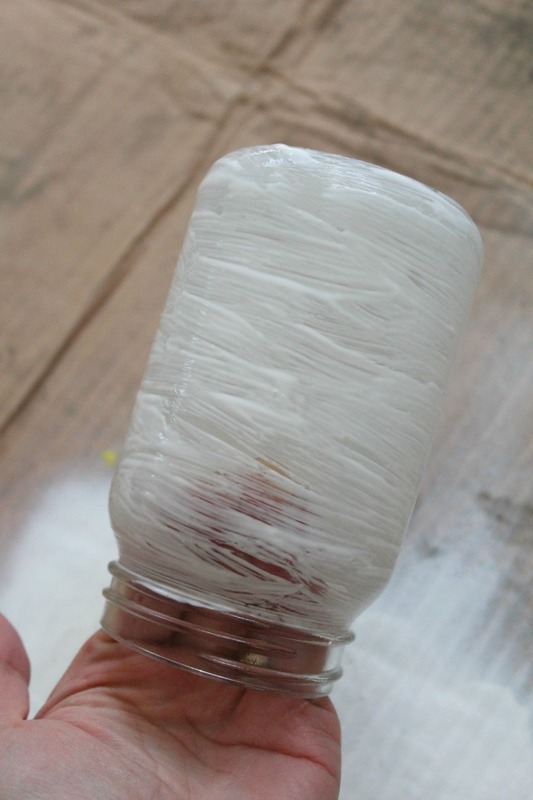 Keep one of your hands or a few fingers inside the jar as you apply Mod Podge. 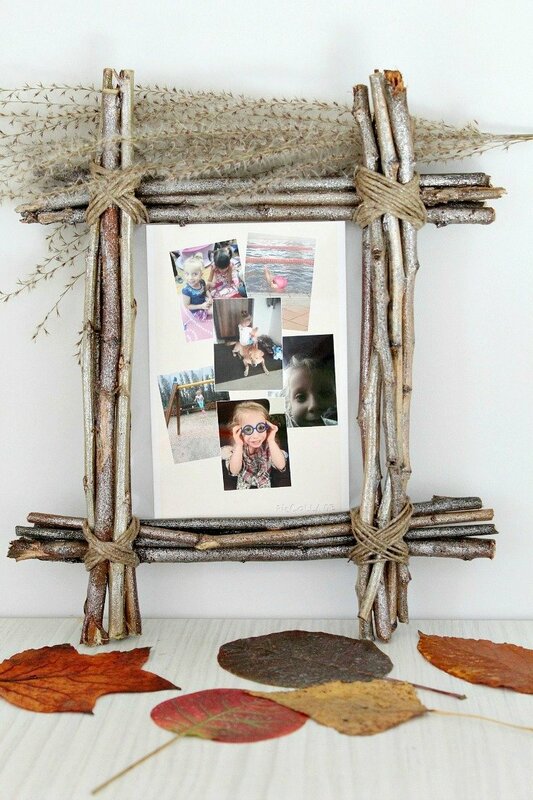 Try and do this as fast as possible so the Mod Podge won’t get dry. 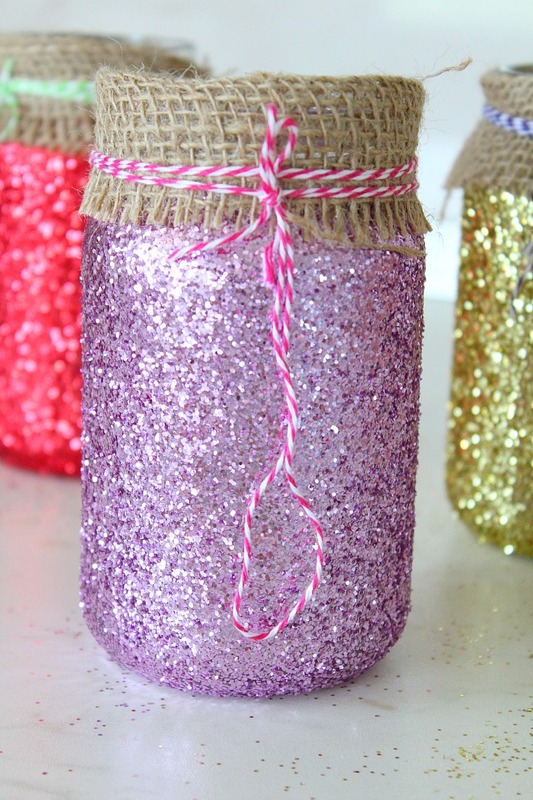 Immediately sprinkle glitter all over the jar, working in small sections. Turn the jar upside down (hold it by the rim) and leave to dry completely. I left mine for about 2 hours, I wanted to make sure I won’t mess up the glitter when I start decorating them with ribbon and twine. 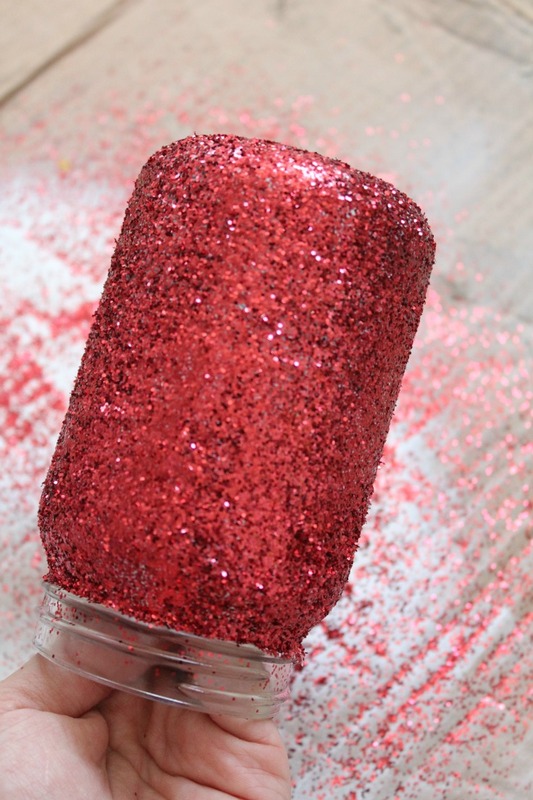 Please note some of the glitter will shake off; that’s ok as long as you covered the whole jar in glitter and no empty spots are left. 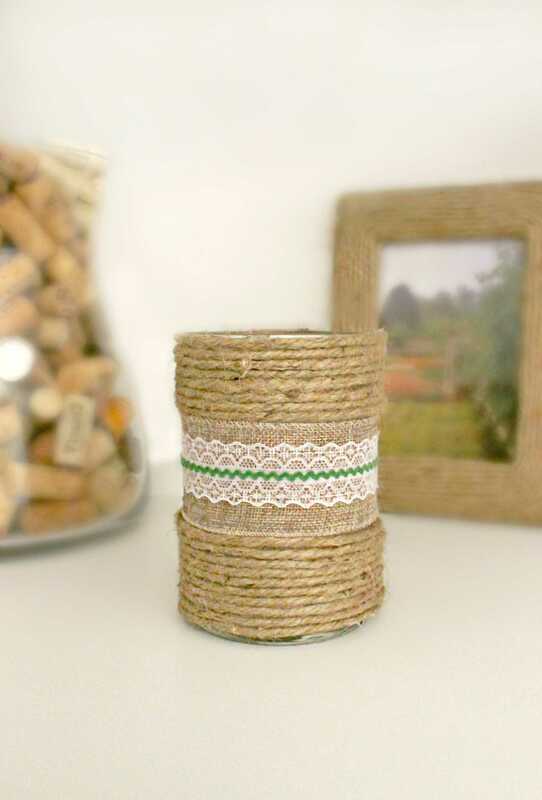 Cut burlap ribbon long enough to go around the jar’s rim, fold in half then wrap some baker’s twine around it and make a knot. 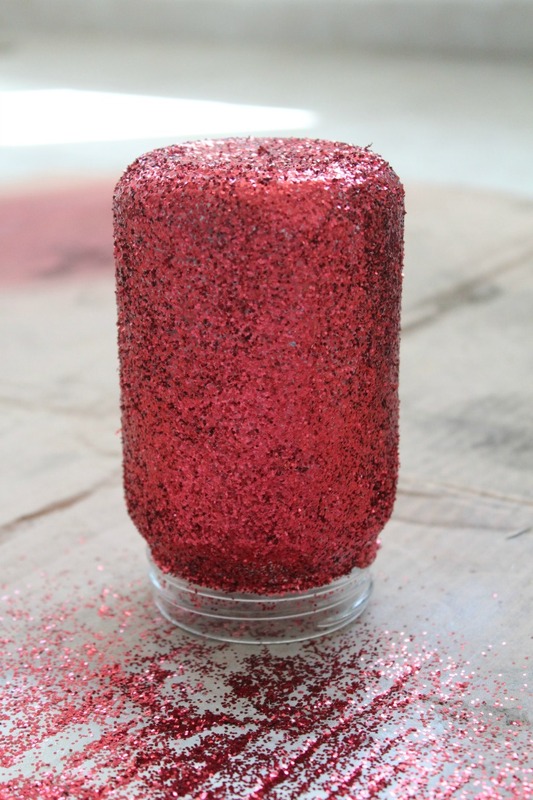 Insert a medium candle (long enough to hit just above the middle of the jar) and light it up. 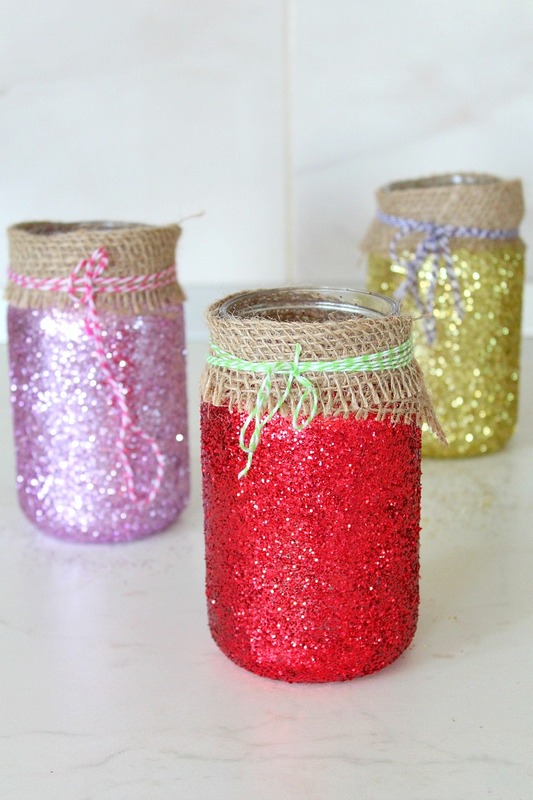 Now you’re ready to display your gorgeous DIY jar luminaries around the house or in your garden!